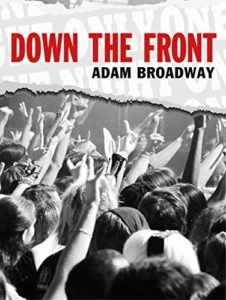 Adam Broadway’s supremely entertaining book, Down the Front, is a collection of writing which explores the minutiae of gig-going, with the band’s themselves regularly being the least memorable aspect of the whole experience. Though the stories he tells are personal to him, there are countless tales which will ring a chord with live music aficionados, the journeys to and from the venues routinely requiring military precision in terms of planning, all of which goes out of the window as soon as you leave the safety of your home. With Adam’s permission, please enjoy the following and make sure you check out his website too. After the gig we all headed off to collect my car. Being typical teenagers, the only problem was that no one had sorted out the transport home. There were now some ten or so people wanting a lift back to Hugo’s village. The bus had left a week ago. I was the only person with a car. It was a small green Volvo. A family car designed for five passengers. I called it ERD. Not wishing to let anyone down or leave them in downtown Guildford late at night, I let everyone pile in. Four in the front, five in the back and two in the boot. Unbelievable. Caz, not one to be beaten, then leaned back out of the window and shouted ‘Cowards!’ We spent the rest of the journey in silence. Everyone must have been thinking the same thing. How on earth did we get out of that? Amazingly we had survived – just. I never knew why Caz had put us in so much danger. Was it bravado, being drunk or downright stupidity? It certainly wasn’t the way to impress me. While music styles and fashions have since moved on considerably, I haven’t seen a gig in Guildford since, out of fear I might get spotted. There are definitely times when being a coward is a good call.